​A medium amber beer with a malty aroma, a full, dry taste & a malty & bitter finish. It has become well regarded throughout the country as a classic, consistently high quality, very drinkable ‘session’ bitter and is a past Champion Best Bitter at the Great British Beer Festival. An American style IPA, amber in colour with a golden hue, a slight maltiness and a well-balanced mouthfeel. It has an aroma of fresh, grassy-green hops which leads to a pleasant bitterness and the late hop addition brings a slight citrus and tropical fruit flavor. ​First produced in 1986 to celebrate Exmoor Ales 1,000th brew, this was the original ‘single malt’ traditional ale initiating the Golden Ale category. Golden in colour with a malty aroma & flavor, a slight sweetness is complimented by its long hoppiness resulting in a remarkable, well rounded beer. It has won over THIRTY beer festival awards since its introduction and has been copied many times but, judging by its continued success, never equalled. Initially brewed as a bottled beer to celebrate Somerset County Cricket Club’s Centenary year, the beer was so well received it was added to our range of always available cask beers. A strong, copper-coloured premium bitter with a good malty taste, full hopped aroma & a long, dry finish. An iconic beer amongst beer aficionados, Exmoor Beast is a dark beer, brewed making liberal use of Chocolate & Crystal malts. 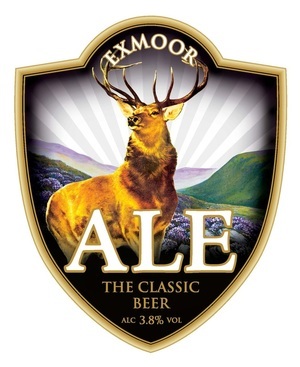 The beer has the characteristics of a strong Porter whilst retaining the distinctive ‘Exmoor’ taste – a superb blend of malt & hops with a complex, long aftertaste.